The amounts involved range from £20,000 to £100,000. Grenfell Tower on fire on 14 June 2017. DETECTIVES INVESTIGATING THE fire at Grenfell Tower in London, in which 72 people died last year, have arrested nine people for fraud. The arrests – of eight men and one woman – were made at addresses across London today. In a statement the Metropolitan Police said all of the offences being investigated are linked to people who have fraudulently benefitted “through housing or allowances, by claiming to be victims of the fire”. The amounts involved range from £20,000 (about €22,700) to £100,000 (about €114,000). Speaking about the arrests, Detective Superintendent Matt Bonner, senior investigating officer, said: “It is completely unacceptable that people would seek to profit from such a human tragedy, and try and attach themselves to a community that they are not part of. In total, 193 officers and staff continue to work full-time on the “complex and large-scale investigation” into the cause and spread of the fire on 14 June 2017, the Met Police said. Some 507 organisations have been identified as having a role in the construction, refurbishment and management of Grenfell Tower. Through ongoing investigative work police are focusing efforts on the 36 organisations who played the most significant part. 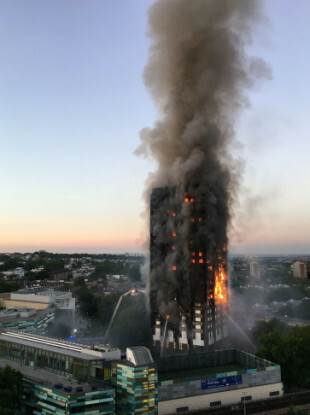 All onsite forensic examinations by police within Grenfell Tower have now concluded and specialists are carrying out a series of offsite reconstruction tests on elements of the building’s construction. Commander Stuart Cundy, who is overseeing the Met Police response, said: “As we approach one year on since the terrible tragedy at Grenfell Tower, my thoughts are with all those so deeply affected by that night. Email “Nine people arrested for 'fraudulently benefitting from Grenfell fire'”. Feedback on “Nine people arrested for 'fraudulently benefitting from Grenfell fire'”.